So today I’m designing some free legging offer for some time in the future, and all I know is I over hear Anna Bryan saying the words – ramen burger, and next thing you know I have one in my hand not even 5 minutes later! Even though I had salad in the fridge… I had to go for it… it IS Friday. Uber recently started delivering choice items of food from trending places in NYC. All you have to do is open the app and slide over to eats. Uber eats. You tap view the menu, select your item and then request a driver, and it’s on it’s way! I’ve known for a little while that they were doing this now, but I never remembered to check it out. Glad my co-workers got in on it today. 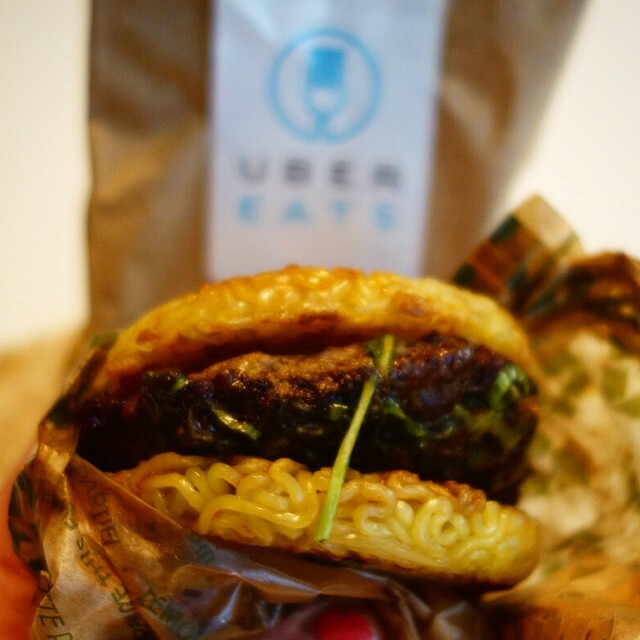 I went on the app, ordered it, took the elevator down from the 5th floor and as I was walking out of the revolving doors I saw the guy pictured in my app pulling up on his bike towards me, handing me a warm ramen burger! It was pretty tasty. Now when I finally check out Smorgasburg in Central Park on July 31st, since I know I’ll prob never make it to the Brooklyn one, that now I can try other things now that I’ve finally had the famous Ramen Burger. The only downside is the $4 delivery charge + you can only get 2 per order. So either you pay $4 for delivery, or you pay $2 if you can split with someone. I couldn’t find someone to split with me so I paid $13 for the burger. I just feel like there shouldn’t be a limit for the amount you can get in one delivery, and that the delivery cost shouldn’t be so high, when normally with Uber all fees are included in one price, even tip. My only question is… are these made with Sun Noodles? !